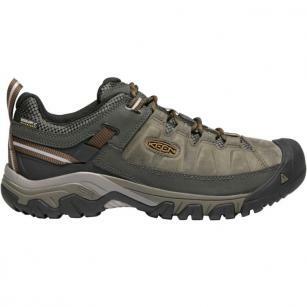 The iconic hiking shoe for men brings an updated look to all-terrain adventures. KEEN carried over the fit, durability, and performance of our award-winning Targhee waterproof boot and took its rugged looks to a new dimension. This shoe includes KEEN.DRY, a proprietary waterproof, breathable membrane that lets vapor out without letting water in. The internal support mechanism is anatomically engineered to provide excellent arch support and cradle the natural contours of the foot.